I often wonder how many perfume gems are “out there” that I’ll never smell. I sample absurd quantities of perfumes — niche, designer/mainstream, “home-brewed” — and I still haven’t tried many established or “old” fragrances (sad, but even a two-year-old scent seems aged when compared to a cologne that's about to make its debut). So, I was pleased with my recent introduction to a “new” (for me) fragrance: 2000’s Amir by Laura Tonatto. Just this year I’ve tried and enjoyed two Tonatto perfumes: Eleonora Duse and Amir. As with so many niche lines, you have to work to get your hands on samples or find testers of Laura Tonatto fragrances. Finally, a new shop in Seattle stocks the Laura Tonatto line, and I’m working my way through the Tonatto perfumes in stock. An amīr (or emir) can be a general, a leader…a prince. Since the word “amir” has Islamic and Middle Eastern connotations, I expected to find (even before smelling Amir or reading its list of notes) sweetness, amber, musk and frankincense in the fragrance. Amir does have a Middle Eastern vibe, but it’s also a bit quirky, not your typical oriental-amber concoction. Amir includes notes of petitgrain, orange, lime wood, myrrh, incense, amber, labdanum and musk. Amir opens with a dusky citrus peel and green-wood/lime accord (this accord has a faint floral character too…a dash of “sour daisy”). During Amir’s mid-development, it smells like an elixir made of myrrh, “cola syrup,” black tea, and labdanum. The dense, liquor-y nature of Amir begins to “dry out” and fragment on skin in late mid-development, and Amir’s base notes smell like a luxurious talcum-incense powder full of labdanum-rich amber and mid-strength musk with a smattering of benzoin and toasted tonka bean. Amir is neither an “ashy/smoky” severe amber-incense fragrance nor an overly sweet amber that strangles the wearer. Amir’s early phase of development reminds me of Crown Perfumery Eau de Russe – but souped up. Amir has good tenacity and sillage and can be worn by amīrahs as well as amīrs. Just like we all look to the past to discover “new” singers, music, books, and artists to enjoy, it pays to search out older fragrances too. My backlog of scents to try is long…and getting longer by the day, but when I come across a great fragrance like Amir, the extra sniffing pays off. 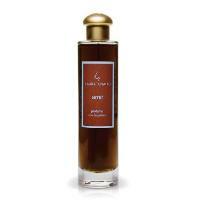 Laura Tonatto Amir Eau de Parfum is €72/$96 for 100 ml. For buying information see the listing for Laura Tonatto under Perfume Houses. 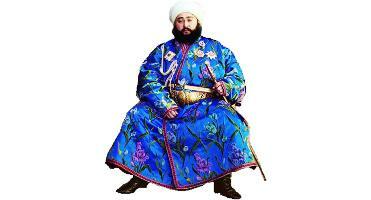 Note: top image is Emir of Bukhara (circa 1910) [altered] by Sergei Prokudin-Gorskii via Wikimedia Commons. Oh! A new shop in Seattle that carries Laura Tonatto? Do tell! I’ll be sure to put in on my itinerary the next time I’m in Seattle (which, fingers crossed, I hope to be soon). Miss K: I still have lots to sniff…but so far am liking the line. LaMaroc: the place is KnowsPerfume in West Seattle…I hope to write a “Shopping” article on it soon. Kevin I’ve GOT to make my way over there- look out Seattlelites, Country bumpkin from Snoho is on the loose ha. Tamara…PUH-LEEZE!!!!! It’s not like we’ll be seeing a pigtailed woman in a blue-and-white-checked apron leading her mule down Main St…..right? HA! Bahahaha! NO. I love that you called me out on it! I clean up real good actually. But some peeps would be all “Snohomish? Uh yah like the North Pole? Shheesh. Were only 45 min. away! It’s a great little new place! I happened upon in its first few days open…and was so excited by all the lines the lovely owner was bringing in. It’s in a great little neighbourhood with a fantastic french bakery, great shoe stores, some vintage clothing stores, some nice new clothing stores and the market sells great wine and cheese. Hope to visit Seattle soon. In the meantime..you guys all should go! That’s *another* thing I miss about Seattle shopping – the fantastic vintage shops! And I enjoyed many a 4th of July on the West Seattle beach. And I love Snohomish, too…except for the black bears. lol Hey, didn’t I just hear in the news there was another bear in the city? LaMaroc are you for reals?? I have not heard of this! Yet I don’t watch the news so…….I’m drinking lots of coffee, gearing up to go on my run on my trail in Lord’s Hill-1,400 acres of forest. I know there could be bears, or cougars but I try not think about it or else I’d never go by myself. And I’ve been going for years, it’s where my heart lives. Or boogeymen for that matter, it’s dark and grey out there today! I was a bit mistaken, Tamara – the attack actually happened in Lake Wenatchee. It was a Bellevue council memeber who was attacked, so I misread or misunderstood the original article as having happened in Bellevue. Still! The guy was attacked in his driveway with his dogs. A friend of mine from North Bend used to carry a gun with him whenever he walked his dog because the little thing was “bear bait”. Does NOT sound at all like my kind of thing, and yet I want to smell it anyway. E. Duse DOES sound like my kind of thing. I want samples… Oh, Visa? Stop hiding in the desk drawer, you shy thing! You know I haven’t used you since last week! Mals: well, if you can find a seller of the Tonattos they usually have GOOD samples for free, little sprays. Sadly, Kevin, I am one of those mule-driving, pigtailed yokels with no local perfume source… It’s TPC or nuthin’. Oh Mals! No your not dear! John Deere’s are NOT mules. If I get over there(in posh West Seattle) anytime soon I’ll pick you up one love! They do, or at least did. I sampled this one and Dama from them. It’s been awhile, though, and the only thing I can remember is that I didn’t care for either one. There are a few oldies that ive never smelled and would really like to. Dior Dune and Jules. Givenchy Vetiver and Incense. Some from the Aramis and Jacomo lines. I keep sampling, but my list never gets any shorter. It’s true! The only way to be safe is not to care at all, and that’s no fun. There are so many classics still out there, so many niche lines I’ve never even tried… Thank God for swapping samples of I’d be in the poor house. Umm… ok, more in the poor house than I already am. I wondered who smelled so good in the food hall. I could barely concentrate on eating my gruel. On the contrary, as my husband always points out: Infinity minus one is still infinity. R07: …and it probably never will! “To Sniff” lists are like the hydra–for every perfume you try and cross off the list, two more appear on the list. How serendipitous that I just now did a google search for Amir, to find your review, posted today! Amir is like that. I’ve had a bottle for quite some time, and probably decant more samples of it than I use myself. When someone expresses an interest in frankincense, dark amber, or rich woods, Amir always comes to mind to share. It is a uniquely singular and well-blended scent; to my nose far from mainstream aesthetics. The woods and resins have a density and heft that makes me reserve it for cold weather, like a fur coat, shearling lines boots and cashmere scarf. The citrus and tea elements really do lift and elevate the perfume in an unobtrusive manner, like an internal smile. It’s a little appreciated gem from the past and I’m really pleased that you recognized and reviewed it! RusticD: “Amir Weather” is about to begin…though I’ve REFUSED to wear a coat or jacket so far…. 94 here yesterday – I’m almost to the point of refusing to wear clothes! I live in Seattle, so of course I must ask: where I can sample this line? I can only think of one or two shops that might… Is it Nasreen? SarahBeth: KnowsPerfume in West Seattle…enjoy! Thanks Kevin! I will check this place out, I am in that area ALL THE TIME! Winifrieda: I take it Kamali Incense has gone the way of the Dodo? I missed it…so thankfully don’t know WHAT I missed! No, Kamali Incense appears to be still going strong – pun intended! Just not available in Australia, they won’t ship overseas from their site…This Amir sounds wonderful, but like the Kamali, not that widely distributed. Kevin: NK Incense is available at Beautyhabit if not elsewhere. I shall send you a sample since the little I have will last me forever. That stuff is thermonuclear. I was lucky enough to receive a sample of this from the lovely Carol at WAFTbyCarol, and I really like it. There was something about it that instantly reminded me of the old Tabu (keeping in mind that I haven’t smelled Tabu in about 100 years!). It *almost* wore me, but a very beautiful and unique scent. Totally off-topic… is that the forehead of an arab, or a bizarre flower? That’s the forehead and ears of a foal (baby horse) taken at sunrise! I had a pic of oakmoss, but every time I looked at it, the ball of oakmoss looked like the head of a furry dog! LOL! LOL! I thought you meant Arabian PERSON! Arabian HORSE never occurred to me! It’s actually a Thoroughbred horse belonging to a client of the co. that I work for. Rapple- I think your new gravator is so pretty! I was thinking of your old one yesterday when I went running through my forest because I see oakmoss everywhere. I’ve even stopped to try and sniff some on some branches. If someone came across me doing that they would think I was SO ODD. ha. Thank you! Seems I read somewhere recently that oakmoss needs to be aged first. I’d love to see the real stuff in trees! I did receive my #19 at the same time that I received a touch of a stomach virus so I’ve avoided perfume and food for the last couple of days. I’ll probably give it a whirl tomorrow though. How about you?? What say you? I am so comforted that I am not the only person who sniffs stuff in the woods. I have something growing on the oak trees here that looks like oakmoss and I’ve considered trying to “cook” it into goo to see what it smells like that way. Rapple~ Oh no! I do hope your feel better soon. Stuff is going around let me tell yah, two of the girls came down with that bug and somehow left the other two unscathed. I can’t full on enjoy anything, just tiny whiffs, it kinda pisses me off! But from what I can smell it’s bracing and from another era that I feel I should have belonged! 19 is a cool heartbreaker that breezes by you and your afraid to stare at her aloof beauty but you must and risk her icy eyes boring into you. Ahhhh! And that’s just a little test, I didn’t want to waste it . Tamara – great description! Seriously!! The tiny whiff I took upon opening slammed me with the memory of my favorite great aunt. But she wore Arpege. I don’t think this smells anything like Arpege does it? Although that would have been in the 60’s, certainly not the new stuff. And I’ve never sampled Arpege! I suppose now I’m going to have to correct that oversight. Too many perfumes, too little time…. but yes of yesterdays past it does…I love the drydown the best, I actually have been wearing it to watch MADMEN and it is so fitting lemme tell yah! Of course you do, dear. (See above.) Actually, I felt compelled to pull out my notes to see *why* I didn’t like it. Turns out that I did, I just didn’t like it as a personal fragrance…and so I passed it on to Daisy. LOL! In my case, it’s more that she’s tried everything I own, so the only “extras” I have to include are samples. At least we all know she has a few hundred people she can pass them along to herself if she doesn’t like them. Boo- Daisy thee Goddess Divine is amazing! I think I’m a Daisy fangirl! We all are Tamara. She’s a beautiful person. I just swapped for some of this and adore it! This sounds wonderful! I am currently working on a bottle of Laura Tonatto Albi Linen Spray that I have come to rely upon heavily to drift off to sleep at night. Kevin, this really sounds delicious — you always have a way with words that makes the scents you enjoy sound irresistible. I’ve been loving Eau de Russe lately, so a comparison to that is definitely a selling point. I just started reading up on all the Tonatto scents and I’m envious that you have a local place to try them. I want to round up some samples in the worst way. Note that these scents are also available as 10ml extraits for $28-$38 at lusciouscargo or apothia. And apothia.com has a few LT scents on sale at the moment. Tempting! Joe: yes, didn’t I notice a “roll-on” too for around $25 of some of the fragrances? Tonatto makes nice samples…more generous by far than decanted/bought samples. I think you might like this one!